"Toucan provided us with exactly what we wanted, an attractive site promoting us as a caring business." These notes are for clients with POP3/IMAP email accounts on Toucan Internet mail servers. Irrespective of your email client you will need the following information to establish your email account and outbound mail facility. Unless there is a good reason why not to, always use the SSL settings. If you are using multiple devices to access your email IMAP is the optimum method. User name or account name: This will be issued to you when the account is established and is typically the lead email address. 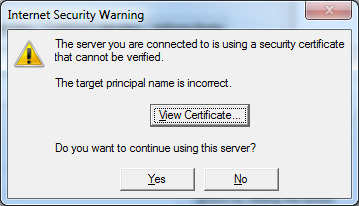 Note: Some mail clients will alert about an unverifiable certificate if using non-SSL connections. This is because the mail software is seeing the SSL at the server IP address, however the SSL is valid for viper.toucaninternet.com and not your mailserver address. There is no security issue and you can keep the existing setting or you can change the mailservers to viper.toucaninternet.com and the warnings will stop. Validation: This is usually in the advanced settings and requires you to confirm if the outbound server requires authentication. 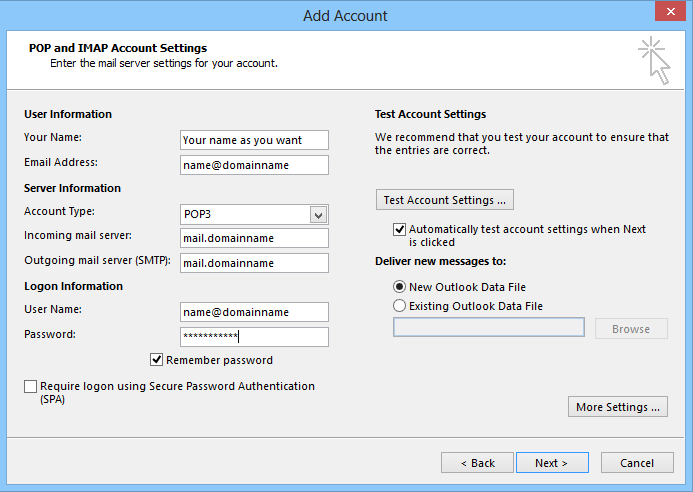 There is normally a default option available that says "make SMPT authentication the same as inbound POP3" or similar. This needs to be selected. Click File in your main menu. 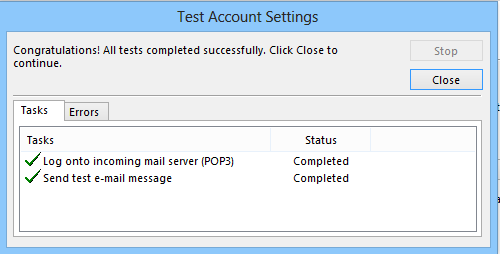 the server type which can be POP3 or IMAP depending on your preference. 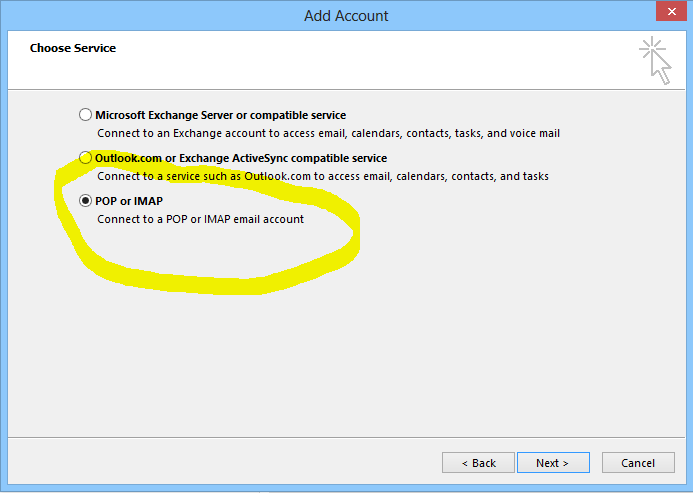 Note, if upgrading from a POP3 account to an IMAP account from experience it is better to start a new account rather than retask an old POP3 account. If trading up to an IMAP account it's usage will probably be different requiring you to upsize your mail box; ask if this is required. 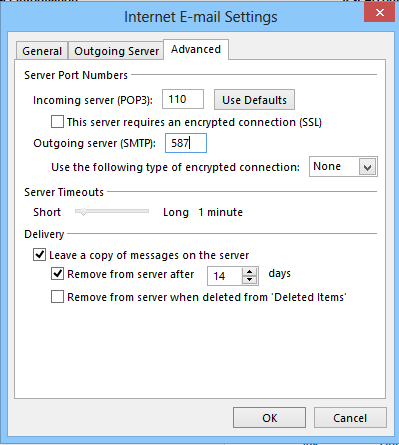 Check the option for SMTP authentication and choose "Use same settings as my incoming server". Then go to the "Advanced" tab. The port numbers are important as if these are wrong the mail will not work properly or at all. Note these instructions are shown for POP3 without SSL. If you choose IMAP without SSL the IMAP port is 143 instead. In either case the outbound SMTP Port is 587. The SSL ports are detailed at the top of this article. Select "OK" and test the settings. You should get a success notice like this. If you are using a Mac, the keychains can be an issue. If this is the case deleting the relevant keychain has helped users set up their mail. If you have had multiple attempts (Usually set to 20) to connect the server may be blocking you as this is characteristic of a concerted hacking attempt on your account. If this is suspected please send us details of the email address that you are setting up with an explanation and we'll clear the lock. Additionally if you want to send us your IP address we'll white list you for a day which overrides the security counter. You can get to your IP address from http://www.whatismyip.com. Mail this information to dns@toucanweb.co.uk and we will reply. The maximum turn around time will be one business day, but typically this will be within a couple of hours. Occasionally you may be challenged once on set up with a security warning. This is OK and you can accept it. If you want to check the certificate it is issued to "viper.toucaninternet.com". 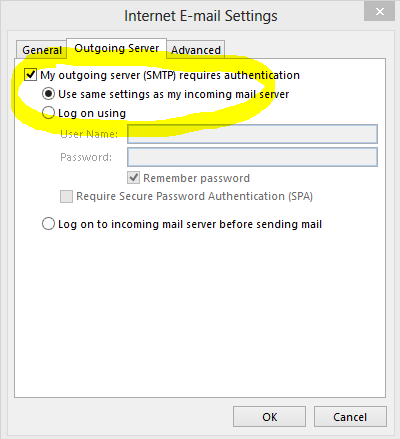 When setting up an email account the basic instructions provided are for the account to be set up on a single device/computer that is to receive and send email to and from that email account. As email accounts can be configured in many permutations it is recommended that email accounts are configured by IT professionals, especially when multiple devices/computers are accessing the same account. Diagnostic support is available to IT professionals installing Toucan Internet email accounts as required. Toucan Internet has a network of IT support companies qualified to integrate its services with online networks, mobile devices and computers and will be pleased to make a recommendation should you not have your own IT support facility. For clarity the scope of Toucan Internet's supply is solely the provision and maintenance of the services excluding local device/computer configurations.